Our Quilter's Hand Repair Soap Trio includes three bars of our luxurious shea butter hand soap in our Jasmine, Herbal and Lavender scents. This combination provides a nice mix of floral, woodsy, and herbal fragrances for the recipient of your gift to enjoy. Our Hand Repair soap recipe of shea butter and cocoa butter provides needed moisture for dry, cracked hands and cracked skin and cuticles. This Quilter's Hand Repair Soap Gift iincludes three full size soap bars individually wrapped in colorful, coordinating paper cigar bands over corrugating cardboard and stacked inside a clear, cellophane bag, tied with matching color raffia. 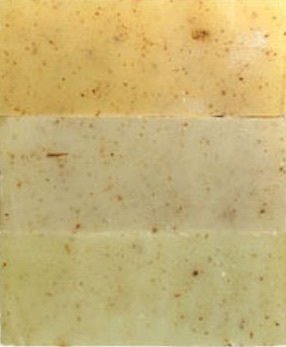 A gold foil product label identities the soaps inside the soap gift.